^ 惠普CEO带头降薪20% 高管降15%并波及普通员工. 南方报网. 2009-02-20 [2009-06-04]. 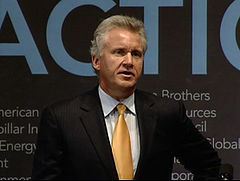 ^ Jeffrey R. Immelt's Biography 互联网档案馆的存檔，存档日期2010-01-02. ^ How Iran Is Killing U.S. Troops in Iraq. Pajamas Media. [2009-04-24]. ^ GE's Iran Policy. ge.com. [2009-04-27]. （原始内容存档于2009-04-23）. ^ Dartmouth Commencement 2004. Dartmouth News Releases. [2007-08-16]. （原始内容存档于2007年10月16日）.